We are an approved dol testing location. Pay any outstanding debts to us. Be at least 15 1/2 or qualify for exception due to drivers ed. Have your license number. It can be created at dol.wa.gov if you 'pre-apply'. We advise you to study the Driver Guide!! Plan at least a full hour for the testing process. Be 18 or have completed appropriate drivers training, such as with us. If you have restrictions, such as SR 22 or VIIL or corrective lenses, etc. you must honor them. We do NOT have a VIIL equipped vehicle available for your use. Make appointment for drive. Specify if you need our for a $45 fee. Fill out application - if not on file - and pay - at least 24 hours prior to exam. Learn or review your hand signals, and how to operate 'your' car as cars vary. Be particularly alert to ensure all lights work, including all three brake lights if so equipped. Front doors and windows must open and close smoothly. Seat belts for you and the examiner must be worn and function properly. Remember you still have the same legal status/requirements in effect until you have your license in hand. Passing scores are strictly numbers in the computer!! We advise you to go to dol.wa.gov and read about the skills exam. Videos are available through dol.wa.gov links to youtube. Practice practice practice - only IF legal for you to do so. Exam takes about 18 minutes in the car and 10 in the office if all goes right. Do NOT be more than ten minutes late or you will need to reschedule for a $25 fee. After you pass, we put the score in the computer, and you move ahead with the dol to get your license at the appropriate time. Some qualify to take care of this online. Must fill out separate testing registration form, agreeing to testing policies. Free exams not retroactive or transferable. Free knowledge exam is administered with original class on last reserved class day. Student must qualify by successfully completing all class/paper -work, attendance, and drive (including fees) requirements in a timely fashion. Free drive exam is administered by appointment, after successful completion of course and of knowledge exam. 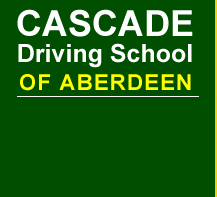 Free drive exam must be completed here at CDSA - Aberdeen within six months of start of class. Need extra exams? Only $25 each for one year after start of class.